It’s also the perfect detangler for kids combating painful tangles quickly and effortlessly without pain or tears. Love the brush. It really makes a difference, when detangling long hair. 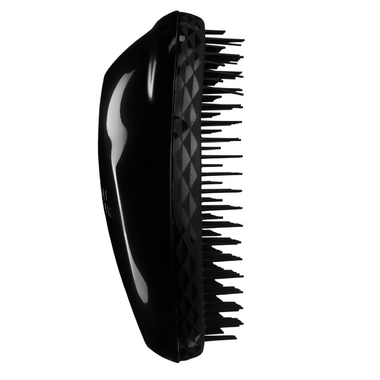 I have been using another type of Tangle Teezer hairbrush for my curly & thick hair. I was satisfied after using it. I did not get tangle anymore. I bought this one for my husband who has soft hairs. I was also attracted by its' name Black Panther at the first place because my husband is Marvel's super fans. The colour is chic. The result is good. I am amazed. My hair is fairly thick and gets quite tangled after washing & conditioning it, but this brush just brushed right through it all! Amazing brush, my 5 year old grand son has long curly hair which tangles easily, he hated it being brushed, however, this item just glides through his hair almost effortlessly. Great buy. This is a great brush for detangling after showering or swimming. I use this one on my 1.5 year old daughter, and I use the finishing brush full time on myself. Wonâ€™t go back to regular brushes since finding these. They are gentle on your hair, preventing breakage, so your hair will seem to grow faster. Regular brushes pull and damage hair when used wet or dry. No more complaining from my son when I brush his hair! My son has ultra fine, curly hair that dreds while he sleeps - this brush got through the tangles and dreds so easily! I use this brush when my hair is wet and it strangled without pulling or breaking my hair. I have long straight hair . I use it while wet. While dry, it canâ€™t get the knots out 100%. Good brush. If you have smaller hands, be aware that it might not be the most comfortable to hold! This is a great brush! My daughter has ringlettes and her hair always has knots, especially after becoming wet or sleeping. We had a "normal" brush before the Tangle Teezer and she would always cry whenever her hair was brushed. Not anymore! Fantastic product! Great to use on wet hair. Detangles gently. Very happy with my purchase. Great for detangling and gentle on hair - doesn't pull hair out. Love this thing, makes for an awesome scalp massage and it's great on my 2 y/o daughter's hair as well. I've definitely noticed it doesn't rip out as much hair when I'm brushing wet after having a shower! Gets the tangles out, but annoying to clean. It really collects dusty sebum from my hair. I use it to detangle in the shower now. Better than the average hair brush. It can be used to message the scalp. Worth the cost. My hair is long and fine - this brush is amazing. I bought the one for thick & curly hair for my niece. worth the money! I've been through quite a few brushes over the years and this is one of the good ones. Gets tangles out of long hair both wet and dry without much strain or effort and without pain. I liked it so much I bought another one for the cottage. Try it, you'll like it. I wasn't convinced at first that a comb with bendy bristles was going to do anything, but I've been searching for a while for something, ANYTHING that would let me comb my 7 year-old daughter's hair without her crying during the detangling process...and this works SO well, I bought a second one for myself! However, I am docking it one star because it IS a bit pricey compared to others I've seen (suddenly this type of brush/comb seems to be all the rage).